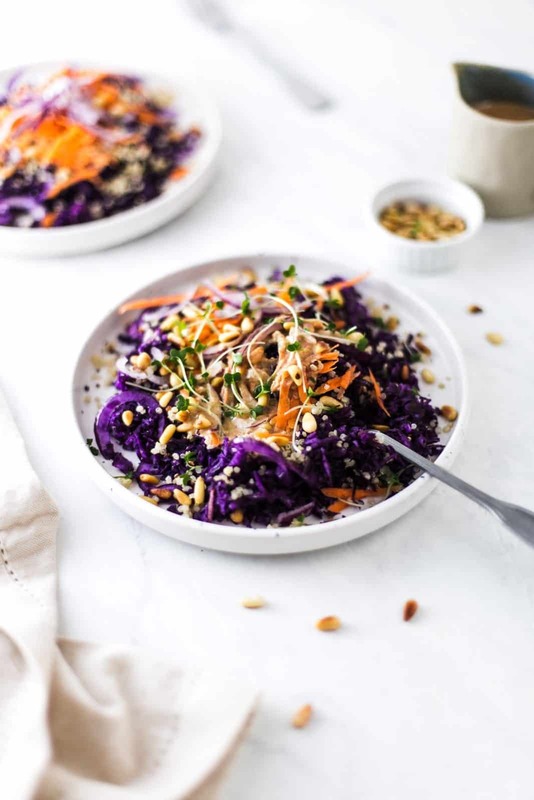 This delicious rainbow quinoa salad can be put together within less than 20 minutes. It’s so easy that all you need to do is simply grate the base ingredients and whisk up the dressing. It’s not only delicious, but also super healthy and slightly addictive! Unpopular opinion: I’m not a fan of salads. Ever since I was a child, I had a very sensitive stomach and eating raw foods would trigger bad stomach ache. Even though I love fruit and vegetables, I was not particularly keen on salads as main dishes. It would just not make sense to me to order salad instead of warm dishes. Moreoever, salads would hardly ever keep me full. This was until I started to realize just how easy it is to make salads more filling. Adding a good protein source and some healthy fats is absolutely essential! 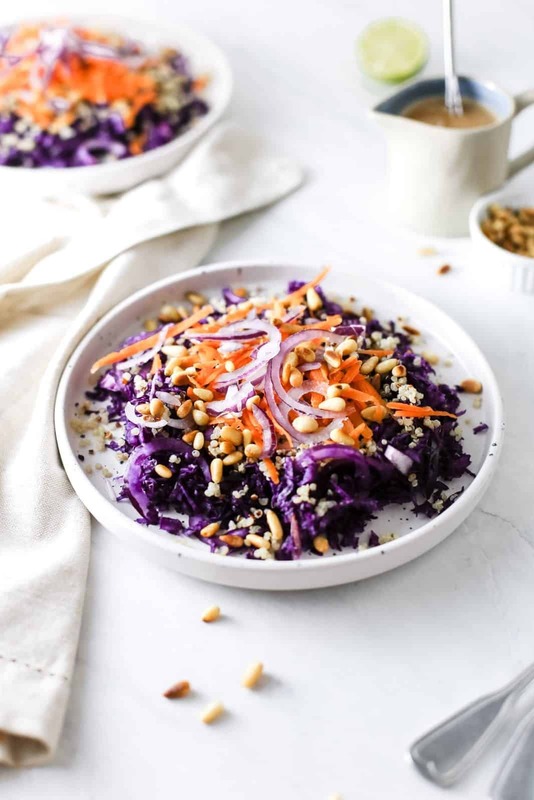 Apart from quinoa, this rainbow red cabbage salad contains two other filling ingredients – pine nuts and peanut butter. They compliment each other wonderfully and add a rich nutty flavour. And while I still love heavier main meals, I am now no longer opposed to devouring a large salad from time to time. 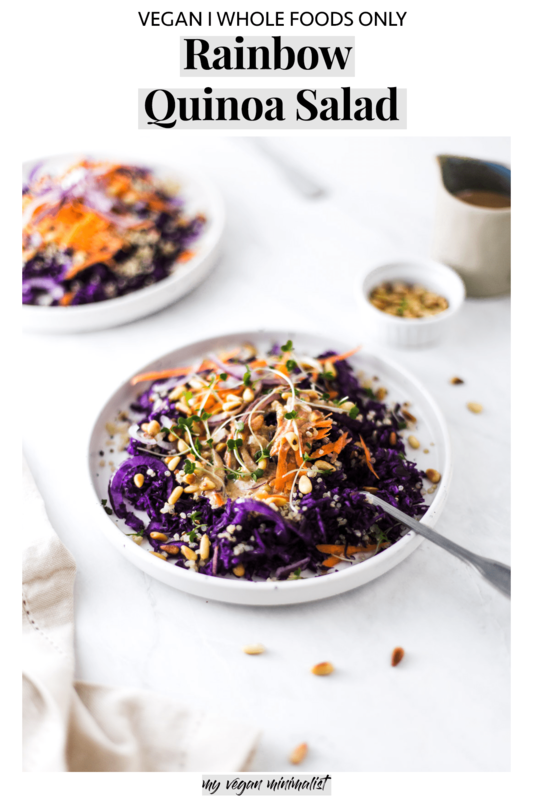 In fact, I had this red cabbage and quinoa salad for breakfast this morning! My Vegan Minimalist is a blog known to celebrate indulgent desserts and treats. Why not enjoy amazing treats just because you’re vegan? While I’m still a big fan of sweet treats, I’ve recently been introducing you to more quick and easy healthy dishes. We’ve tried the gorgeous Ayurvedic turmeric tea, immune-boosting pomegranate smoothie and delicious butternut squash soup. And what better way to celebrate the spring equinox than with fresh whole foods? Quinoa is a great source of protein and fibre. Regardless of whether you’re vegan or not, getting your protein from various different sources is super important! 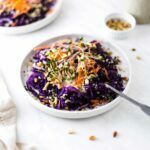 I recently watched Immy Lucas from Sustainably Vegan talk about her top 5 healthy foods and grains made the list. She mentions the incredible effect eating diverse protein sources had on her weight lighting capabilities and recovery time. Whether you’re into sports or not, make sure you’re diversifying your protein sources and not relying solely on tofu and meat substitutes. Being a huge fan of rice spring rolls, I have been trying to perfect my peanut sauce for years. To make the sauce, you will need peanut butter and soy sauce as your main ingredients. I like to use 100% peanut butter meaning no extra oil, sugar or salt was added. Peanut butter is absolutely one of my favourite vegan staples. Remember those peanut butter chocolate brownies? This time I wanted to showcase the versatility of peanut butter by using it in a savoury dish. If you don’t have a whisk to mix all the ingredients with you can simply use a fork. Cook quinoa according to instructions given on the packet. Do not overcook. In the meantime, roast pine nuts (no oil) in a non-stick pan. Be careful not to burn them. Great carrots, cabbage and dice the onion. Mix and sprinkle with salad cress. For the sauce: mix peanut butter and soy sauce. Add salt, cayenne pepper, sugar, lime and whisk well. Pour warm water very slowly over your sauce mixture until desired consistency. It should be easily poured and warm beige in colour. 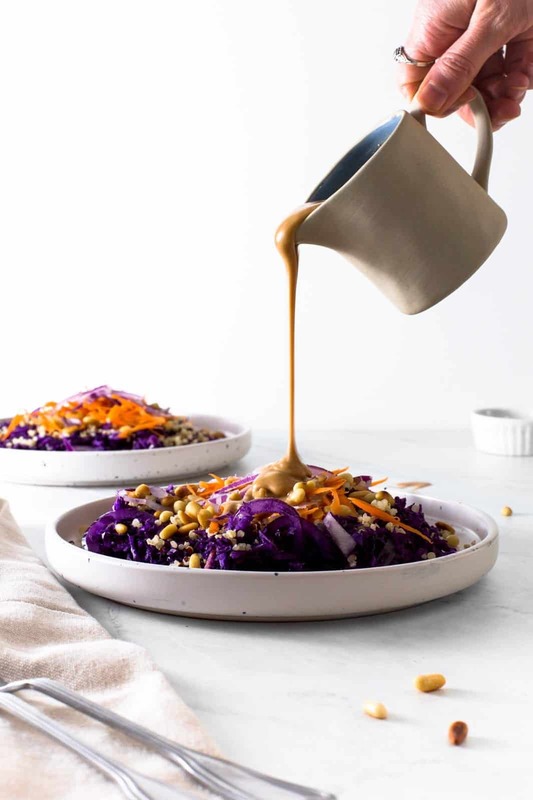 Drizzle peanut butter dressing/sauce over your salad and serve. Looking for more vegan recipes inspiration? Make sure to also follow along on my Pinterest, Instagram and Facebook.